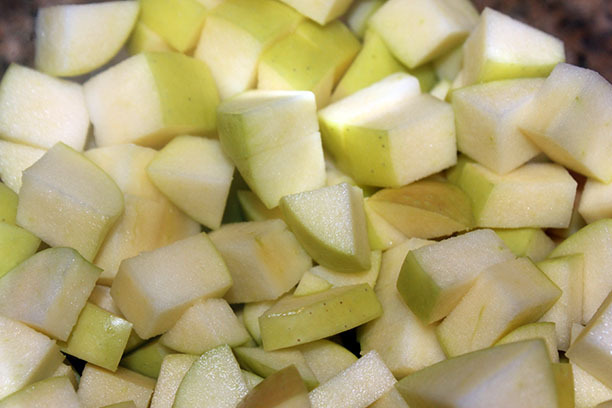 Wash and dry apples. 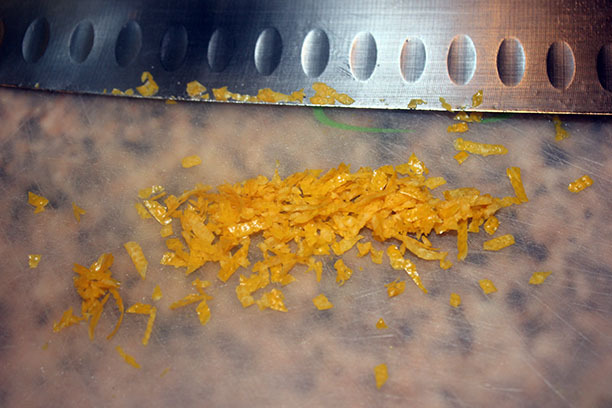 Cut into small pieces, tossing core. 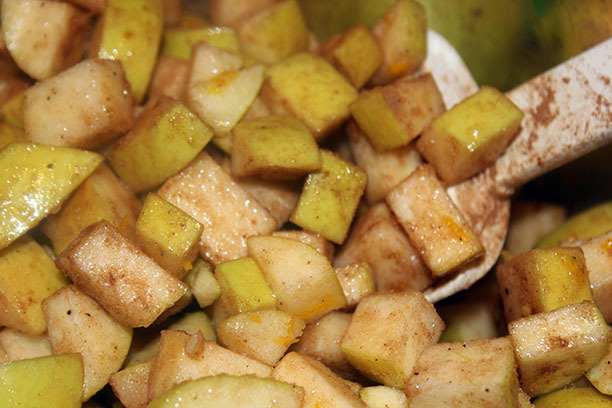 Place into a bowl. 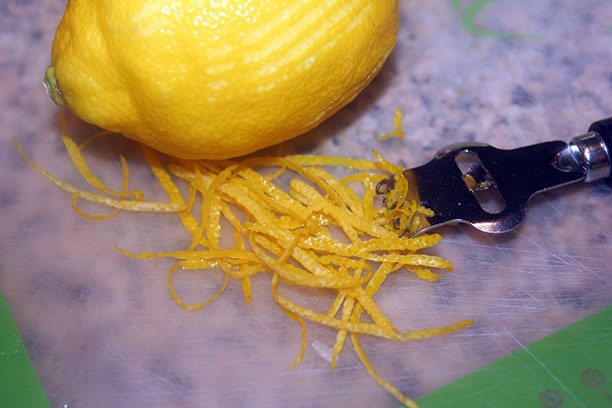 Zest your lemon to extract about a teaspoon of zest and chop, add to apples. 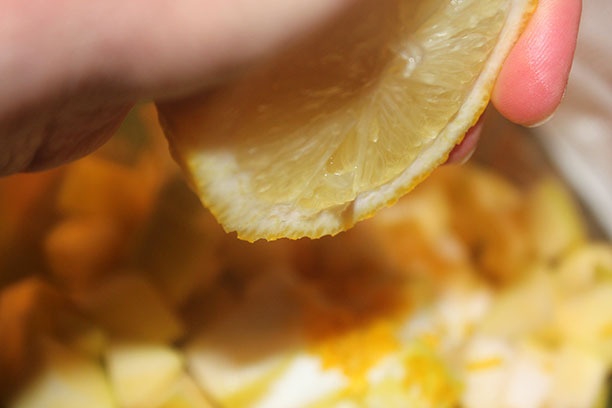 Add sugar and squeeze the lemon to add juice. Toss. 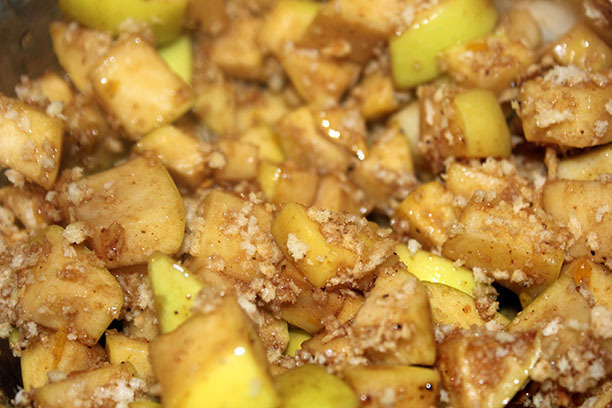 This will add a coating to the apples that allows them to hold evenly onto the fabulous New Hudson Apple Pie Spice. 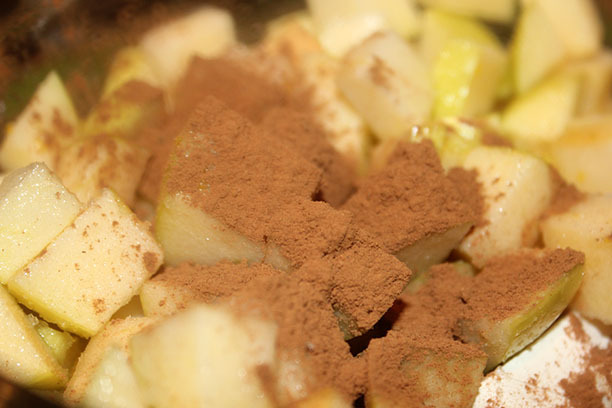 Now add New Hudson Apple Pie Spice and toss again. 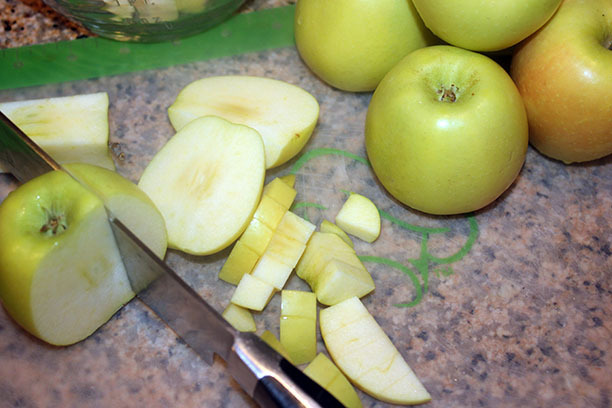 Cover bowl and microwave for a few minutes to warm apples. 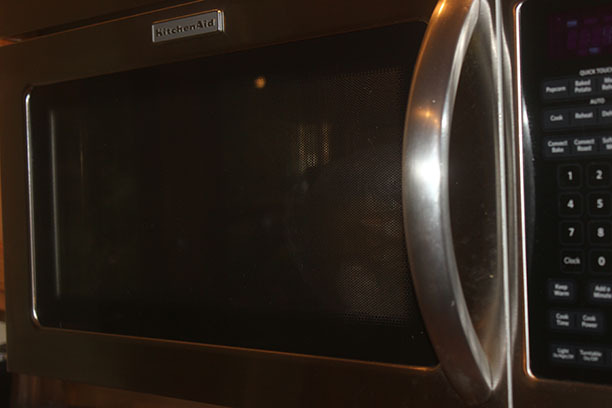 Then let sit for 10 minutes. 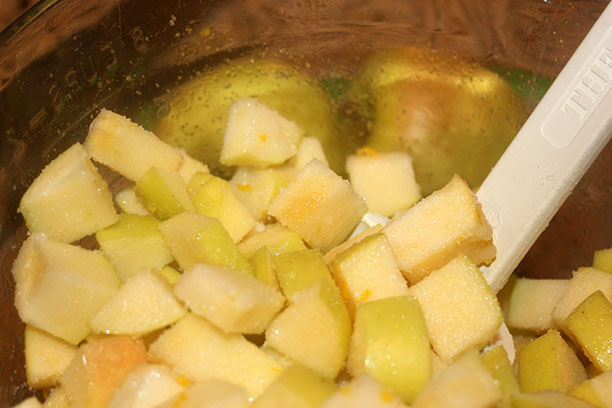 Drain and save the juices. 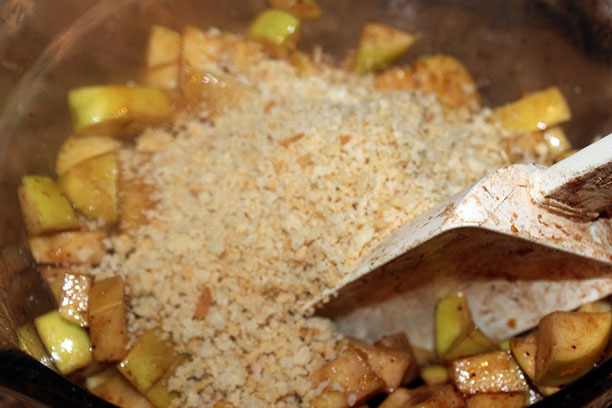 Last step before assembly is to add the panko breadcrumbs to the apples, and toss. 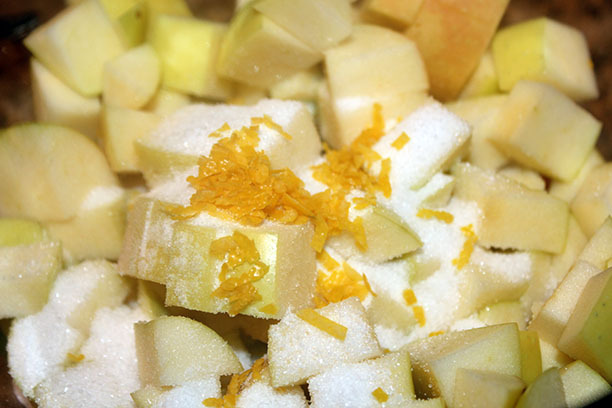 We add breadcrumbs to absorb the juices as the apples cook. 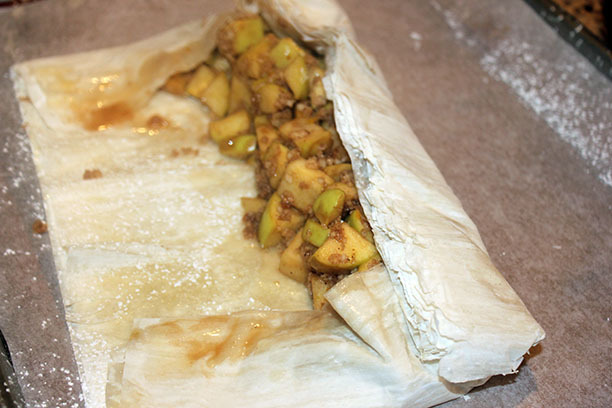 It adds a really nice texture to the strudel. 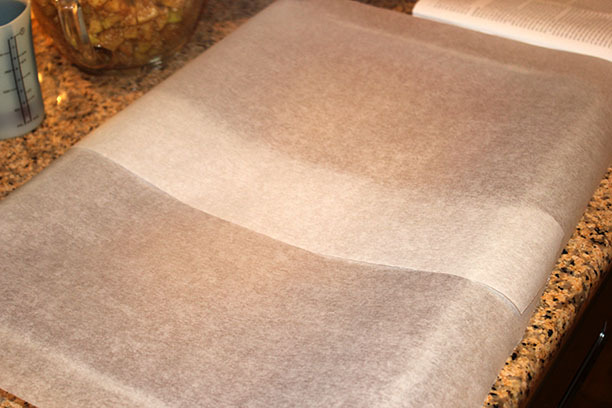 Now prepare a sheet pan by lining with parchment paper. 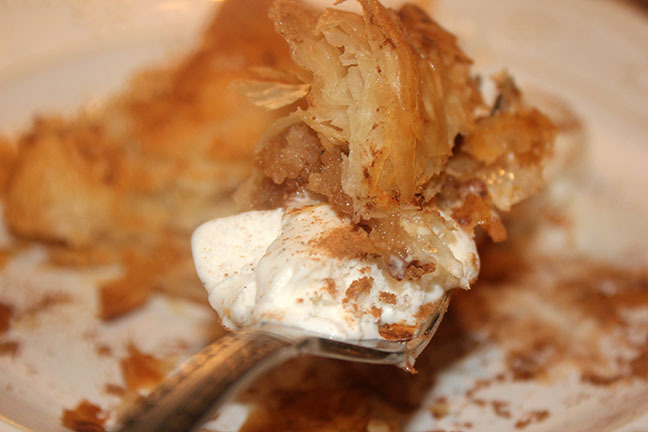 The phyllo dough is really fragile, so handle very gently. 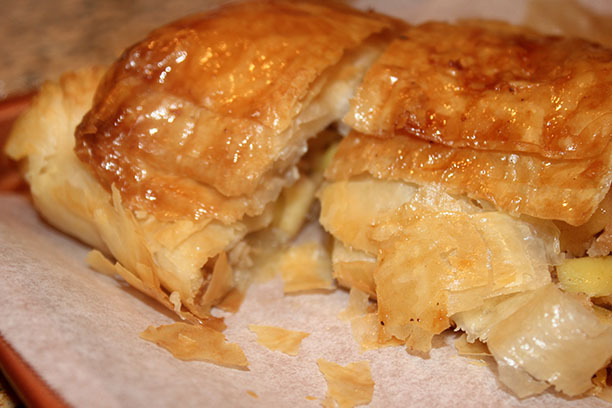 If they tear a bit it is all good. 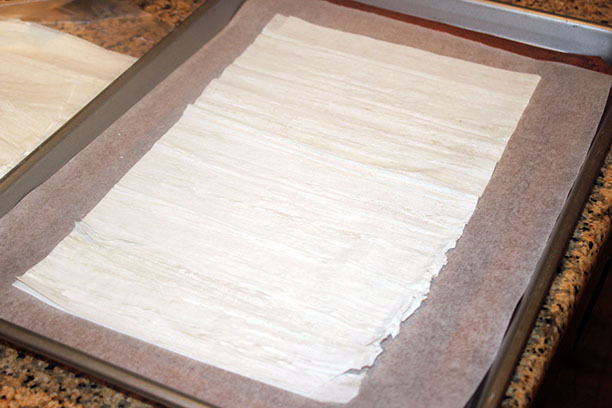 We are going to layer eight sheets together. 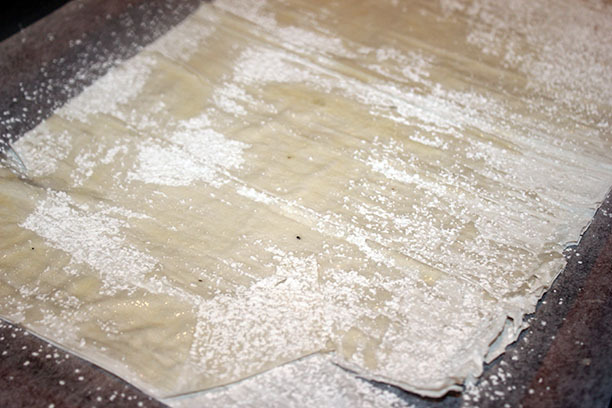 For the first layer gently brush phyllo sheet with melted butter, and then sprinkle with powdered sugar. 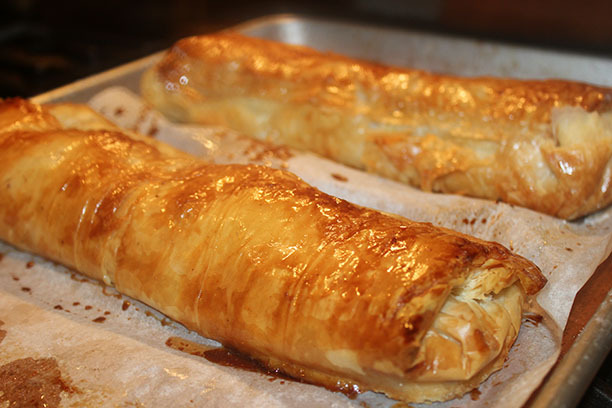 For the next layer I used cooking spray instead of butter and sprinkled with powdered sugar. 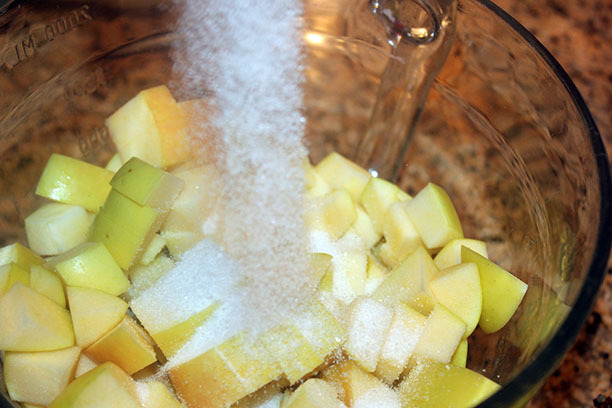 If you wish you can use all butter or all cooking spray as well. 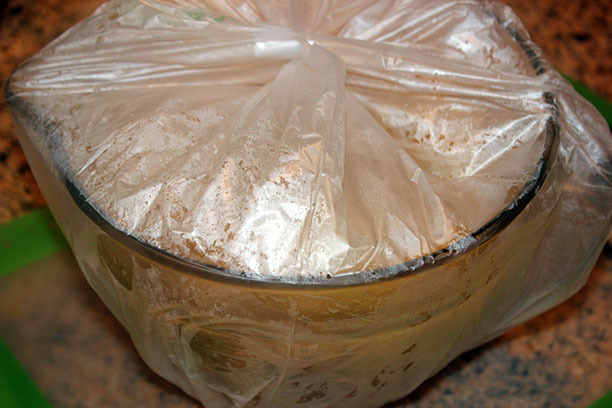 You will want to work quickly with the dough so that it doesn’t dry out. 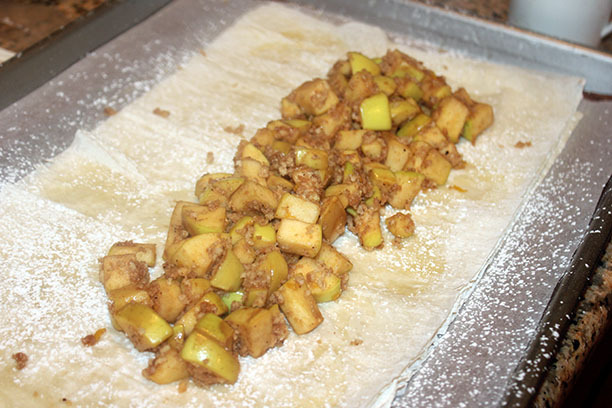 Once you have layered 8 sheets, now lets add the apples. 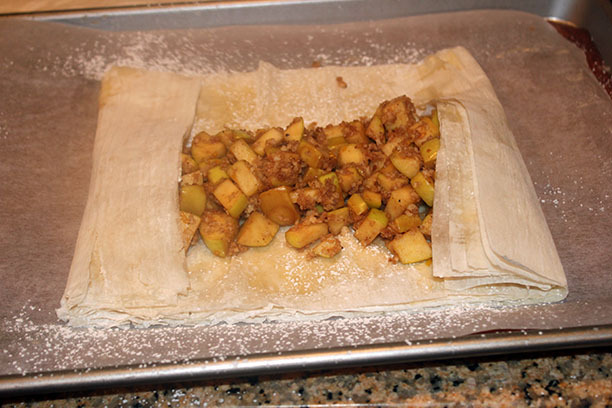 Use half of the warm apples and spoon lengthwise leaving room to fold. followed by the last edge over the top of the first. 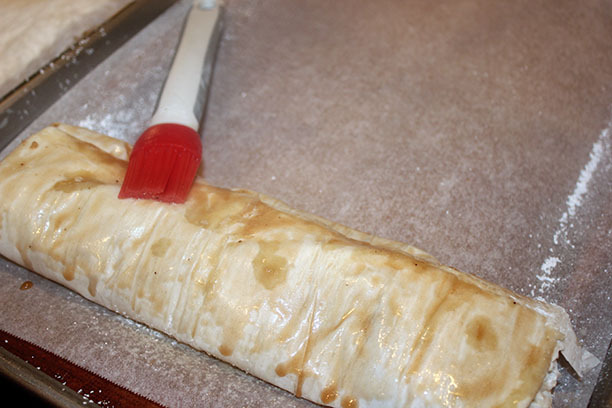 Use the remaining apple juices to brush the top of the strudel. Repeat to make one more. 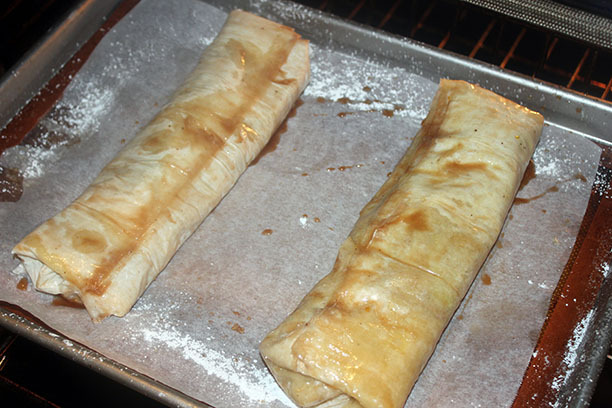 Bake for approximately 40 minutes, rotate sheet pan halfway through cooking, let it get nice and golden brown. 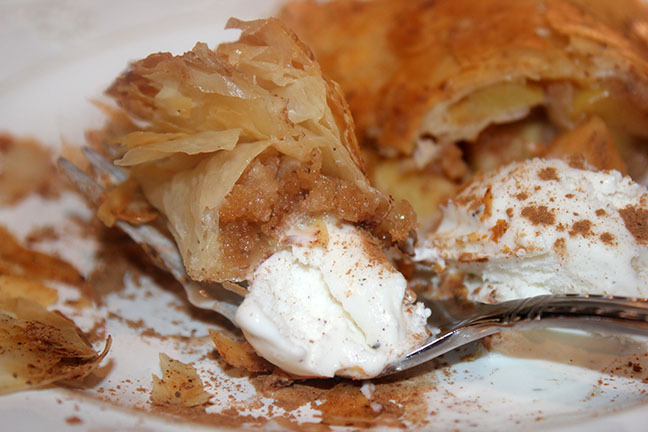 Cool for 30 minutes, slice and serve with ice cream! 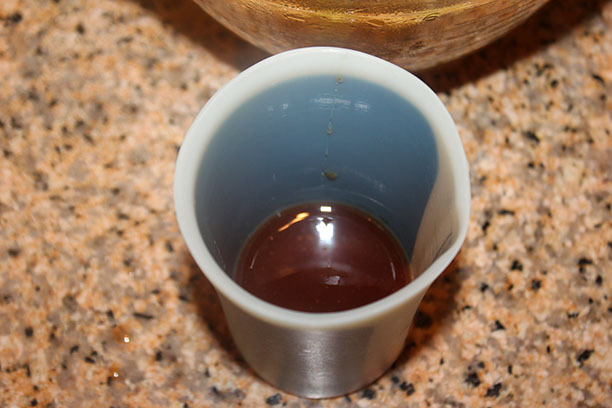 Makes a beautiful presentation for a holiday dessert.